• A woman paralyzed on the left side of her body who believes she is lifting a tray of drinks with both hands offers a unique opportunity to test Freud’s theory of denial. • A man who insists he is talking with God challenges us to ask: Could we be “wired” for religious experience? • A woman who hallucinates cartoon characters illustrates how, in a sense, we are all hallucinating, all the time. 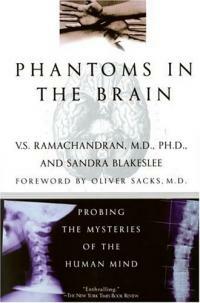 Dr. Ramachandran’s inspired medical detective work pushes the boundaries of medicine’s last great frontier — the human mind — yielding new and provocative insights into the “big questions” about consciousness and the self. The world is not only queerer than we imagine; it is queerer than we can imagine. Who was this rolling out of the bedroom in a wheelchair? Sam couldn’t believe his eyes. His mother, Ellen, had just returned home the night before, having spent two weeks at the Kaiser Permanente hospital recuperating from a stroke. Mom had always been fastidious about her looks. Clothes and makeup were Martha Stewart perfect, with beautifully coiffed hair and fingernails painted in tasteful shades of pink or red. But today something was seriously wrong. The naturally curly hair on the left side of Ellen’s head was uncombed, so that it stuck out in little nestlike clumps, whereas the rest of her hair was neatly styled. Her green shawl was hanging entirely over her right shoulder and dragging on the floor. She had applied rather bright red lipstick to her upper right and lower right lips, leaving the rest of her mouth bare. Likewise, there was a trace of eyeliner and mascara on her right eye but the left eye was unadorned. The final touch was a spot of rouge on her right cheek — very carefully applied so as not to appear as if she were trying to hide her ill health but enough to demonstrate that she still cared about her looks. It was almost as though someone had used a wet towel to erase all the makeup on the left side of his mother’s face! Ellen raised her eyebrow in surprise. What was her son talking about? She had spent half an hour getting ready this morning and felt she looked as good as she possibly could, given the circumstances. Ten minutes later, as they sat eating breakfast, Ellen ignored all the food on the left side of her plate, including the fresh-squeezed orange juice she so loved. Sam raced for the phone and called me, as one of the physicians who had spent time with his mother at the hospital. Sam and I had gotten to know one another while I had been seeing a stroke patient who shared a room with his mother. “It’s all right”, I said, “don’t be alarmed. Your mother is suffering from a common neurological syndrome called hemi-neglect, a condition that often follows strokes in the right brain, especially in the right parietal lobe. Neglect patients are profoundly indifferent to objects and events in the left side of the world, sometimes including the left side of their own bodies”. The next day I was able to demonstrate this to Sam’s satisfaction by doing a simple clinical test on Ellen. I sat directly in front of her and said, “Fixate steadily on my nose and try not to move your eyes.” When her gaze was fixed, I held my index finger up near her face, just to the left of her nose, and wiggled it vigorously. “I see a finger wiggling”, she replied. “Okay”, I said. “Keep your eyes fixed on the same spot on my nose.” Then, very slowly and casually, I raised the same finger to the same position, just left of her nose. But this time I was careful not to move it abruptly. Ellen looked blank. Without having her attention drawn to the finger — via motion or other strong cues — she was oblivious. Sam began to understand the nature of his mother’s problem, the important distinction between blindness and neglect. His mother would ignore him completely if he stood on her left side and did nothing. But if he jumped up and down and waved his arms, she would sometimes turn around and look. For the same reason, Ellen fails to notice the left side of her face in a mirror, forgets to apply makeup on the left side of her face, and doesn’t comb her hair or brush her teeth on that side. And, not surprisingly, she even ignores all the food on the left side of her plate. But when her son points to things in the neglected area, forcing her to pay attention, Ellen might say, “Ah, how nice. Fresh-squeezed orange juice!” or “How embarrassing. My lipstick is crooked and my hair unkempt”. Sam was baffled. Would he have to assist Ellen for the rest of her life with simple day-to-day chores like applying makeup? Would his mother remain like this forever, or could I do something to help her? I assured Sam that I’d try to help. Neglect is a fairly common problem1 and I’ve always been intrigued by it. Beyond its immediate relevance to a patient’s ability to care for herself, it has profound implications for understanding how the brain creates a spatial representation of the world, how it deals with left and right and how we are able — at a moment’s notice — to pay attention to different portions of the visual scene. The great German philosopher Immanuel Kant became so obsessed with our “innate” concepts of space and time that he spent thirty years pacing up and down his veranda thinking about this problem. (Some of his ideas later inspired Mach and Einstein.) If we could somehow transport Ellen back in a time machine to visit him, I’m sure he’d be just as fascinated by her symptoms as you or I and would wonder whether we modern scientists had any inkling of what causes this strange condition. When you glance at any visual scene, the image excites receptors in your retina and sets in motion a complex cascade of events that culminate in your perception of the world. As we noted in earlier chapters, the message from the eye is first mapped onto an area in the back of brain called the primary visual cortex. From there it is relayed along two pathways, the how pathway to the parietal lobe and the what pathway to the temporal lobe (see Figure 4.5, Chapter 4). The temporal lobes are concerned with recognizing and naming individual objects and responding to them with the appropriate emotions. The parietal lobes, on the other hand, are concerned with discerning the spatial layout of the external world, allowing you to navigate through space, reach out for objects, dodge missiles and otherwise know where you are. This division of labor between temporal and parietal lobes can explain almost all of the peculiar constellation of symptoms one sees in neglect patients in whom one parietal lobe — especially the right — is damaged, as is the case with Ellen. If you let her wander around by herself, she will not pay attention to the left side of space and anything that happens in it. She will even bump into objects on her left side or stub her left toe on a raised pavement. (I’ll later explain why this doesn’t happen with left parietal damage.) However, because Ellen’s temporal lobes are still intact, she has no difficulty recognizing objects and events as long as her attention is drawn to them. We now know that even so basic a skill as attention requires the participation of many far-flung regions of the brain. We’ve already talked about the visual, auditory and somatosensory systems, but other special brain regions carry out equally important tasks. The reticular activating system — a tangle of neurons in the brain stem that projects widely to vast regions of the brain — activates the entire cerebral cortex, leading to arousal and wakefulness, or — when needed — a small portion of the cortex, leading to selective attention. The limbic system is concerned with emotional behavior and evaluation of the emotional significance and potential value of events in the external world. The frontal lobes are concerned with more abstract processes like judgment, foresight and planning. All of these areas are interconnected in a positive feedback loop — a recursive, echolike reverberation — that takes a stimulus from the outside world, extracts its salient features and then bounces it from region to region, before eventually figuring out what it is and how to respond to it.3 Should I fight, flee, eat or kiss? The simultaneous deployment of all these mechanisms culminates in perception. But imagine what would happen if any part of this positive feedback loop were interrupted so that the whole process was compromised. You would then no longer notice what was happening on one side of the world. You would be a neglect patient. But we still have to explain why neglect occurs primarily after injury to the right parietal lobe and not to the left. Why the asymmetry? Though the real reason continues to elude us, Marcel Mesulam of Harvard University has proposed an ingenious theory. We know that the left hemisphere is specialized for many aspects of language and the right hemisphere for emotions and “global” or holistic aspects of sensory processing. But Mesulam suggests there is another fundamental difference. Given its role in holistic aspects of vision, the right hemisphere has a broad “searchlight” of attention that encompasses both the entire left and entire right visual fields. The left hemisphere, on the other hand, has a much smaller searchlight, which is confined entirely to the right side of the world (perhaps because it is so busy with other things, such as language). As a result of this rather odd arrangement, if the left hemisphere is damaged, it loses its searchlight, but the right can compensate because it casts a searchlight on the entire world. When the right hemisphere is damaged, on the other hand, the global searchlight is gone but the left hemisphere cannot fully compensate for the loss because its searchlight is confined only to the right side. This would explain why neglect is only seen in patients whose right hemisphere is damaged. So neglect is not blindness, but rather a general indifference to objects and events on the left. But how profound is this indifference? After all, even you and I, when driving home from work ignoring familiar terrain, will perk up immediately if we see an accident. This suggests that at some level the unattended visual information from the road must have been getting through. Is Ellen’s indifference an extreme version of the same phenomenon? Is it possible that even though she doesn’t notice things consciously, some of the information “leaks” through? Do these patients at some level “see” what they don’t see? This is not an easy question to answer, but in 1988 two Oxford researchers, Peter Haligan and John Marshall,4 took up the challenge. They devised a clever way to demonstrate that neglect patients are subconsciously aware of some of the things that are going on on their left side, even though they appear not to be. They showed patients drawings of two houses, one below the other, that were completely identical except for one salient feature — the house on the top had flames and smoke spewing from windows on the left. They then asked the patient whether the houses looked the same or different. The first neglect patient whom they studied said, not surprisingly, that the houses looked identical, since he did not pay attention to the left side of either drawing. But when forced to choose — “Come on, now, which house would you rather live in?” — he picked the bottom house, the one not on fire. For reasons he could not express, he said that he “preferred” that house. A form of blindsight, perhaps? Could it be that even though he is not paying attention to the left side of the house, some of the information about the flames and smoke leaks through to his right hemisphere through some alternate pathway and alerts him to danger? The experiment implies once again that there is no blindness in the left visual field, for if there were, how could he process this level of detail about the left side of the house under any circumstances? Neglect stories are very popular with medical students. Oliver Sacks5 tells the strange tale of a woman who, like many left hemineglect patients, ate food only from the right side of her plate. But she knew what was up and realized that if she wanted all her dinner, she had to shift her head, so as to see the food on the left. But given her general indifference to the left and reluctance even to look to the left she adopted a comically ingenious solution. She rolled her wheelchair in a huge circle to the right, traveling 340 degrees or so until finally her eyes would fall on the uneaten food. That consumed, she’d make another rotation, to eat the remaining half of the food on her plate, and so on, round and round, until it was gone. It never occurred to her that she could just turn left because — for her — the left simply didn’t exist. One morning not long ago while I was fixing the sprinkler system in our yard, my wife brought me an interesting-looking letter. I receive many letters each week, but this one was postmarked from Panama and had an exotic stamp and curious lettering. I wiped my hands on a towel and started to read a rather eloquent description of what it feels like to suffer from hemineglect. You might feel I’m exaggerating. Someone looking at me would see a person with limbs that, though paralyzed, obviously exist and are just as obviously connected to my body. “There is no way”, Steve concluded, “that you can have any idea of what happens in Wonderland unless a denizen describes it to you”. Neglect is clinically important for two reasons. First, although a majority of patients recover completely after a few weeks, there is a subset in whom the disorder can persist indefinitely. For them, neglect remains a genuine nuisance even though it may not be a life-threatening disorder. Second, even those patients who seem to recover from neglect quickly can be seriously handicapped because their indifference to the left during the first few days hinders rehabilitation. When a physical therapist urges them to exercise the left arm, they don’t see the point in doing so because they don’t notice that it is not performing well. This is a problem because in stroke rehabilitation most recovery from paralysis occurs in the first few weeks and after this “window of plasticity”, the left hand tends not to regain function. Physicians, therefore, do their utmost to coax people into using their left hands and legs in the first few weeks — a task frustrated by the neglect syndrome. Is there some trick you could use to make the patient accept the left side of the world and start noticing that her arm was not moving? What would happen if you put a mirror on the patient’s right side at right angles to her shoulder? (If she were sitting in a phone booth, this would correspond to the right wall of the booth.) If she now looks in the mirror, she will see the reflection of everything on her left side, including people, events and objects, as well as her own left arm. But since the reflection itself is on the right — in her nonneglected field — would she suddenly start paying attention to these things? Would she realize that these people, events and objects were on her left even though the reflection of them is on the right? If it worked, a trick of this kind would be nothing short of a miracle. Efforts to treat neglect have frustrated patients and physicians alike ever since the condition was first clinically described more than sixty years ago. I telephoned Sam and asked whether his mother, Ellen, might be interested in trying out the mirror idea. It might help Ellen recover more quickly and it was easy enough to try. Normal adults rarely confuse a mirror reflection for a real object. When you spot a car fast approaching you in your rearview mirror, you don’t jam on your brakes. You accelerate forward even though it appears that the image of the car is approaching rapidly from the front. Likewise, if a burglar opened the door behind you as you were shaving in the bathroom, you’d spin around to confront him — not attack the reflection in the mirror. But like Alice in Wonderland, patients like Ellen and Steve seem to inhabit a strange no-man’s-land between illusion and reality — a “warped world”, as Steve called it, and there is no easy way to predict how they will react to a mirror. Even though all of us, neglect patients and normal people alike, are familiar with mirrors and take them for granted, there is something inherently surrealistic about mirror images. The optics are simple enough, but no one has any inkling of what brain mechanisms are activated when we look at a mirror reflection, of what brain processes are involved in our special ability to comprehend the paradoxical juxtaposition of a real object and its optical “twin”. Given the right parietal lobe’s important role in dealing with spatial relationships and “holistic” aspects of vision, would a neglect patient have special problems dealing with mirror reflections? When Ellen came to my lab, I first conducted a series of simple clinical tests to confirm the diagnosis of hemineglect. She flunked every one of them. First, I asked her to sit on a chair facing me and to look at my nose. I then took a pen, held it up to her right ear and began to move it slowly, in a sweeping arc, all the way to her left ear. I asked Ellen to follow the pen with her eyes, and she did so with no trouble until I reached her nose. At that point her eyes began to wander off, and soon she was looking at me, having “lost sight of” the pen near her nose. Paradoxically, a person who is really blind in her left visual field wouldn’t display this behavior. If anything, she would try to move her eyes ahead of the pen in an effort to compensate for her blindness. When I asked her to draw a clock, Ellen made a full circle instead of just a half circle. This is a fairly common response because circle drawing is a highly overlearned motor response and the stroke did not compromise it. But when it came time for Ellen to fill in the numbers, she stopped, stared hard at the circle and then proceeded to write the numbers 1 to 12, cramped entirely on the right side of the circle! Finally, I took a sheet of paper, put it in front of Ellen and asked her to draw a flower. “What kind of flower?” she said. Again, Ellen paused, as if the task were difficult, and finally drew another circle. So far so good. Then she painstakingly drew a series of little petals — it was a daisy — all scrunched on the right side of the flower (Figure 6.1). Ellen’s inability to draw the left half of objects was to be expected, since she ignores the left when her eyes are open. But what would happen with them closed? Would the mental representation of a flower — the daisy in her mind’s eye — be a whole flower or just half of one? In other words, how deep does the neglect reverberate into her brain? Many neglect patients will also draw only half the flower when drawing from memory even with their eyes closed. This implies that the patient has also lost the ability to “scan” the left side of the internal mental picture of the flower. Ellen closed her eyes and drew another circle. Then, furrowing her brow in concentration, she daintily drew five petals all on the right side of the daisy! It was as though the internal template she used to produce the drawing was only half preserved and therefore the left side of the flower simply drops out, even when she’s just imagining it. After a half-hour break, we returned to the lab to try out the mirror. She sat in her wheelchair, fluffing up her hair with her good hand, and smiled sweetly. I stood on her right holding a mirror on my chest so that when Ellen faced straight forward in the chair, the mirror was parallel to the right arm of the wheelchair (and her profile) and about two feet away from her nose. I then asked her to turn her head about sixty degrees and look into the mirror. From this vantage point Ellen can clearly see the neglected side of the world reflected in the mirror. She is looking to her right, into her good side, so to speak, and she knows perfectly well what a mirror is, so she knows that it is reflecting objects on her left side. Since the information about the left side of the world is now coming from the right side the nonneglected side would the mirror help her “overcome” her neglect so that she correctly reached for the objects on the left, just as a normal person might? Or would she say to herself, “Oops, that object is really in my neglected field, so let me ignore it.” The answer, as so often happens in science, was that she did neither. In fact, she did something completely outlandish. I asked her to describe her eyeglasses, lipstick and clothing while looking straight into the mirror. She did so with no trouble. On receiving a cue, one of my students standing on Ellen’s left side held out a pen so that it was well within the reach of her good right hand but entirely within the neglected left visual field. (This turned out to be about eight inches below and to the left of her nose.) Ellen could see my student’s arm as well as the pen clearly in the mirror, as there was no intent to deceive her about the presence of a mirror. When I repeated the same process ten minutes later, she said, “It’s behind the mirror”, and reached around and began groping with my belt buckle. A little later she even tried peeking over the edge of the mirror to look for the pen. So Ellen was behaving as though the reflection were a real object that she could reach out and grab. In my fifteen-year career, I’d never seen anything like this — a perfectly intelligent, levelheaded adult making the absurd blunder of thinking that an object was actually inside the mirror. We wanted to make sure that Ellen’s behavior did not arise from some clumsiness of her arm movements or a failure to understand what mirrors are. So we simply tried placing the mirror at arm’s length in front of her, just like a bathroom mirror at home. This time the pen appeared just behind and above her right shoulder (but just outside her visual field). She saw it in the mirror and her hand went straight back behind her to grab it. So her failure in the earlier task could not be explained by claiming that she was disoriented, clumsy or confused as a result of her stroke. We decided to give a name to Ellen’s condition — “mirror agnosia” or “the looking glass syndrome” in honor of Lewis Carroll. Indeed, Lewis Carroll is known to have suffered from migraine attacks caused by arterial spasms. If they affected his right parietal lobe, he may have suffered momentary confusion with mirrors that might not only have inspired him to write Through the Looking Glass but may help explain his general obsession with mirrors, mirror writing and left-right reversal. One wonders whether Leonardo da Vinci’s preoccupation with left-right reversed writing had a similar origin. The looking glass syndrome was intriguing to watch, but it was also frustrating because I had initially hoped for the exact opposite reaction — that the mirror would make Ellen more aware of the left side of the world and help with rehabilitation. The next step was to find out how widespread this syndrome is. Do all neglect patients behave like Ellen? In testing another twenty patients, I found that many had the same kind of mirror agnosia. They would reach into the mirror for the pen or a piece of candy when it was held in the neglected field. They knew perfectly well they were looking into a mirror and yet they made the same mistake as Ellen. Not all of the patients made this error, however. Some of them initially looked perplexed, but upon seeing the reflection of the pen or candy in the mirror, they chuckled, and — with a conspiratorial air — reached correctly for the object on the left just as you or I might. One patient even turned his head to the left — something he was ordinarily reluctant to do — and beamed triumphandy as he snatched the reward. These few patients were clearly paying attention to objects they had previously ignored, raising a fascinating therapeutic possibility. Will repeated exposure to the mirror help some people overcome neglect, gradually becoming more aware of the left side of the world?9 We are hoping to try this someday in the clinic. Therapy aside, the scientist in me is equally intrigued by mirror agnosia — the patient’s failure to reach correctly for the real object. Even my two-year-old son, when shown candy only visible in the mirror, giggled, turned around and snatched the sweet. Yet the much older and wiser Ellen could not do this. I can think of at least two interpretations of why she might lack this ability. First, it’s possible that the syndrome is caused by her neglect. It’s as though the patient was saying to herself, unconsciously, “Since the reflection is in the mirror, the object must be on my left. But the left does not exist on my planet — therefore, the object must be inside the mirror.” However absurd this interpretation may seem to us with our intact brains, it’s the only one that would make any sense to Ellen, given her “reality”. Second, the looking glass syndrome may not be a direct consequence of neglect, even though it is usually accompanied by neglect. We know that when the right parietal lobe is damaged, patients have all kinds of difficulties with spatial tasks, and the looking glass syndrome may simply be an especially florid manifestation of such deficits. Responding correctly to a mirror image requires you simultaneously to hold in your mind the reflection as well as the object that is producing it and then perform the required mental gymnastics to locate correctly the object that produced the reflection. This very subtle ability may be compromised by lesions in the right parietal lobe, given the important role of that structure in dealing with spatial attributes of the world. If so, mirror agnosia might provide a new bedside test for detecting right parietal lesions.10 In an age of escalating costs of brain imaging, any simple new test would be a useful addition to the neurologist’s diagnostic kit. The strangest aspect of the looking glass syndrome, however, is listening to patients’ reactions. It’s astonishing that the mere confrontation with a mirror flips these patients into the twilight zone so that they are unable — or reluctant — to draw the simple logical inference that since the reflection is on the right, the object producing it must be on the left. It’s as though for these patients even the laws of optics have changed, at least for this small corner of their universe. We ordinarily think of our intellect and “high-level” knowledge — such as laws concerning geometrical optics — as being immune to the vagaries of sensory input. But these patients teach us that this is not always true. Indeed, for them it’s the other way around. Not only is their sensory world warped, but their knowledge base is twisted to accommodate the strange new world they inhabit.11 Their attention deficits seem to permeate their whole outlook, rendering them unable to tell whether a mirror reflection is a real object or not, even though they can carry on normal conversations on other topics — politics, sports or chess — just as well as you or I. Asking these patients what is the “true location” of the object they see in the mirror is like asking a normal person what is north of the North Pole. Or whether an irrational number (like the square root of 2 or ? with a never-ending string of decimals) really exists or not. This raises profound philosophical questions about how sure we can be that our own grasp on reality is all that secure. An alien four-dimensional creature watching us from his four-dimensional world might regard our behavior to be just as perverse, inept and absurdly comical as we regard the bumblings of neglect patients trapped in their strange looking-glass world. CHAPTER 12 Do Martians See Red?